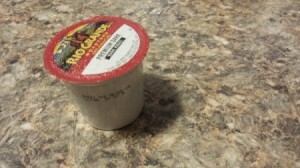 Take an unused Keurig cup and place it in the drain. A great temporary solution that works like a charm! This doesn't make sense. What the purpose of putting the k cup in the drain? Editor's Note: Makeshift tub or sink drain stopper to keep the water in the basin. GENUIS ! That's all I have to say. Thanks for the help! Wowww... who would have thought???? PERFECT! Thank You! Thanks for the tip. It works. Yeah!! This did not really work for me if you only need a stopper for a short period of time then this is great but I all my water was gone in 10 min. I need something to put in my bathroom sink drain, since the metal stopper stopped working, and the rubber one is too big to fit. I worry that I might drop an earring or some other small piece of jewelry down the drain. I'm going to get one of these and poke holes in the bottom so the water will drain through, but still not leave too big an opening.